Bombastic but ultimately-empty rhetoric is the kind of thing that keeps part-time blaggers/bloggers like me going. It’s too easy to say nice things in the hope of scoring retweets to get my precious view count up. But here’s a thing that I believe with 100% sincerity (‘cos I’m a stats guy). Wolf Alice are Britain’s best live band right now. 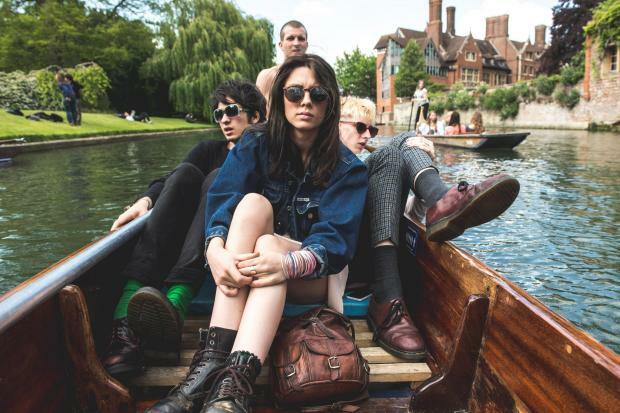 Wolf Alice swung past Oxford 10 months ago before their second EP – ‘Creature Songs’ – was released. It was a show which pointed to a bright future for the band, but like a greedy kid at Christmas, I wanted more. There was an underlying hope of ‘how great can this band be with a bigger collection of thunderous post-grunge rock ‘n roll?’ And so 10 months on, with a first U.S. tour behind them, a debut album close to being released, extensive radio play and a ballooning fan base, what we got was Wolf Alice v2.0. Harder, better, faster, strobe lighting. They have played more shows this year already (by April 1st 2015) than compared to all of 2014 (told you I’m a stats guy/thanks Songkick). Like Jafar, Dr. Evil and Pinky & The Brain, they are ready to take over the world. Except Wolf Alice might actually pull it off. Latest single ‘Giant Peach’ showed singer/guitarist Ellie Rowsell experimenting with her singing voice, throwing in chant-like bursts, yelps, and fun little low-octave moments. That experimentation has now become stitched into their live shows, such as on the show opener, ‘Fluffy’. Instead of a pretty-literal translation from record to real-life, the live version is made fresh with little nuanced changes like Ellie changing up the vocal tone and style of delivery. For a band that’s clearly destined to tour the dickens out of their music this year, that variety helps to spice things up. The world will finally get studio versions of live staples ‘Your Love’s Whore’ and ‘You’re A Germ’ once the album arrives, but what they represent is what we expect Wolf Alice to be right now. The lightness of touch they show on ‘Your Love’s Whore’, building gradually from the rhythm section to an awesome cacophony of noise by the end. And on the flipside, a whole lot of fury on ‘You’re A Germ’ as the crowd screams back their 1 times tables in the chorus. Even more exciting is the notion of experimentation, with the band not afraid to take a risk or two. An airing of forthcoming album track ‘Soapy Water’ sees drummer Theo using a drum pad for the first time, while Ellie channels a little of Lana Del Ray as she croons wistfully. Wolf Alice have done mid-tempo before, life started for them as a folk-pop two-piece. But ‘Soapy Water’ is something completely different.And that’s exciting. However, main-set closer and latest single ‘Giant Peach’ is everything we’ve come to know and love: pure chaotic perfection. Somehow it sounds ten times heavier than anything else that’s come before as a gargantuan Muse/Led Zepp-in-their-heyday guitar riff floors the room. I’m told an encore happened afterwards but I was busy picking up pieces of my shattered skull from the floor. Get ready to bow to your new overlords, Wolf Alice. And get ready for their debut album, ‘My Love Is Cool’, dropping on June 22nd through Dirty Hit. This entry was posted in Live Reviews and tagged Wolf Alice. Bookmark the permalink.